Howarth Bouis was awarded the 2016 World Food Prize, along with colleagues from the International Potato Center (CIP), for his pioneering work in helping to reduce global hidden hunger through biofortification. Their work with sweet potato has already improved the health of over 15 million people in Africa by reducing Vitamin A deficiency. Several hundred million globally will potentially benefit in coming decades. 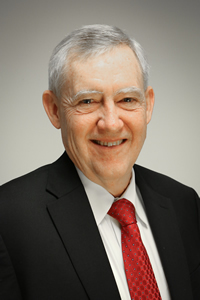 Howarth Bouis is the founder and until October 2016, was the director of the HarvestPlus program, which is a joint venture of the International Center for Tropical Agriculture (CIAT) and the International Food Policy Research Institute (IFPRI). HarvestPlus is dedicated to promoting nutrition, health, and livelihoods by enriching staple food crops with micronutrients, a process known as biofortification. Bouis pioneered this concept in the early 1990s and has devoted his career to turning this idea into a global movement that currently reaches more than 15 million smallholder farming families in low-income countries. As director of HarvestPlus, Bouis coordinated an interdisciplinary, global effort to breed and disseminate micronutrient-rich staple food crops to reduce hidden hunger among malnourished populations. Since 1993, he has sought to promote biofortification within the CGIAR consortium, among national agricultural research centers, and in the international agriculture and nutrition communities. He received his BA in Economics from Stanford University and his MA and PhD from Stanford University's Food Research Institute. After receiving his PhD, Bouis was offered a postdoctoral position in 1982 in the Food Consumption and Nutrition Division of IFPRI to undertake a two-year research project on the Philippines. He subsequently worked as a Research Fellow and Senior Research Fellow in the same division, before becoming director of HarvestPlus in 2003. His research concentrated on understanding how economic factors affect food demand and nutrition outcomes, particularly in Asia. Bouis is currently guest scientist at the International Rice Research Institute in the Philippines, continuing to serve HarvestPlus in an advocacy and advisory role.